When I record games there's always a black bar on the side of my screen, how do I fix this? This is what happens when I try that. Watch that video and take a screen shot where the black bar is. 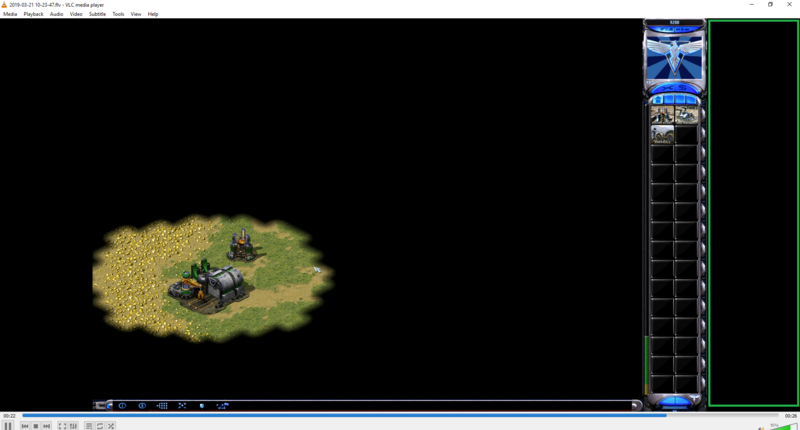 Yeah, because your resolution isn't 16x9, those black bars are added by vlc because you have the window maximized. OBS can stretch it to 16x9 but I don't think it looks better. You would have to set Output (Scaled) Resolution to 1920x1080. You would have to set Output (Scaled) Resolution to 1920x1080. If you set your desktop resolution to a 4:3 screen ratio (like 800x600 or 1024x768 for example), then watch your second video in full screen, you'll notice that the black bars are gone. So basically, regardless of which screen resolution you use, some people will see the black bars, but some won't, depending on their screen settings. Set base and output to 1920x1080 then launch ra2yr skirmish and add a game capture source. In the game capture source, you'll enable scaling and set it to 1920x1080. It seems I've fixed it, there's an option for when I'm editing the video to change the resolution on export, this seems to have fixed it on YouTube.